Rochford confirmed his departure in a statement this evening. 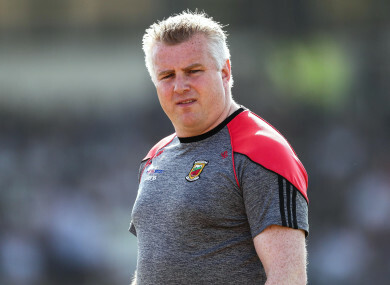 MAYO ARE ON the look-out for a new senior football manager after Stephen Rochford confirmed his resignation following three seasons in charge. Rochford looked set to remain at the helm 2019 when Peter Ford and Shane Conway were confirmed as the new members of his backroom team earlier this week. But speculation began to mount last night that Rochford was on the verge of resigning and he confirmed his departure in a statement released this evening. “It was apparent from what transpired at that meeting that the desired level of support for me as manager was not forthcoming from the Executive Committee. This disappoints me greatly. “Accordingly, I see no value in meeting with the officers of the board and I am resigning my position as Mayo manager. I thank all those who supported me during the past three years, two of which saw Mayo come so close to winning the All-Ireland title. “Like all Mayo people, I enjoyed the good days when the team won and suffered the disappointments when the results didn’t go our way. It was a great privilege to manage the Mayo team. “The 2018 season was a disappointing one for all involved, and for our supporters. “However, I had every confidence that our new backroom team had the capacity to build on the progress of previous years and drive the team on in 2019. “In particular, I thank the players, backroom team, spouses and partners, family members, our team sponsors Intersport Elverys, the county board, the clubs and the Mayo supporters worldwide who turned out in huge numbers to support us during the three years and who lent financial backing to the team. “A special word of thanks to my wife, Laura, and our children, and both our families, for their support and forbearance at all times. The 39-year-old took Mayo to two All-Ireland finals during his tenure. They lost to Dublin by a point after a replay in 2016 and by the same margin to the same opposition in the 2017 decider. Mayo’s interests in this year’s championship were ended by Kildare in round 3 of the qualifiers back in June. Mayo chairman Mike Connolly thanked Rochford following his decision to step down. “We sincerely thank Stephen Rochford for all the hard work and commitment he has given to Mayo GAA since he was appointed in 2015,” Connolly said. “Stephen has given an enormous amount of service to Mayo and has given us as supporters many great days on the pitch. Email “Rochford resigns as Mayo boss over lack of support from board executive”. Feedback on “Rochford resigns as Mayo boss over lack of support from board executive”.